Atlanta, Georgia; July 19, 2016 3:12 PM—The parties have their presumptive presidential nominees. Now, as with elections past, handicappers are looking at possible predictors of the outcome. They are trotting out all the usual factors: economic growth, inflation, unemployment—even the stock market. Beware: This year, none of them will help call the winner. Back in 2012, researchers at the Socionomics Institute released a comprehensive study showing that major economic factors—namely, inflation and unemployment rates—have had no statistically significant bearing on presidential election results. “These findings are counter-intuitive, but there they are,” said Matt Lampert, the Institute’s director and one of the study’s authors. The authors did find an abiding, strong and statistically significant relationship between presidential election results and the stock market’s performance leading up to Election Day – but only when an incumbent ran. When no incumbent ran, even the stock market was an ineffective barometer of which party’s candidate would win. 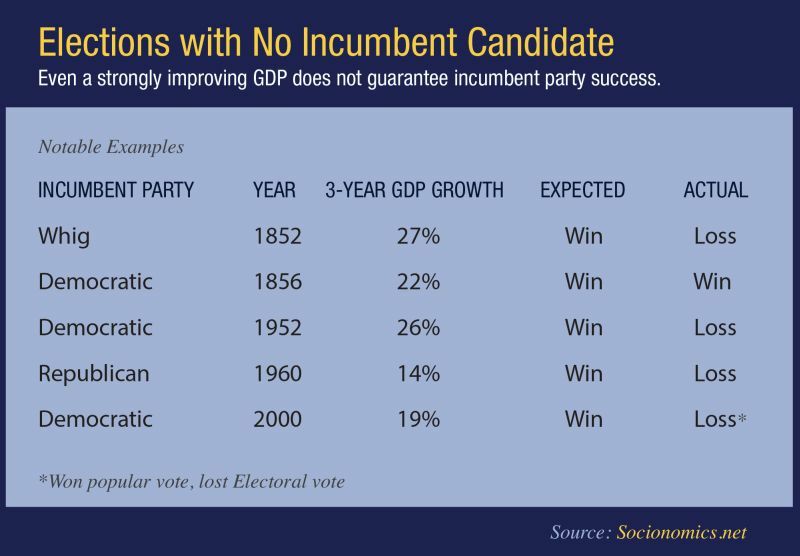 The authors also tested economic variables specifically when no incumbent was running. GDP, inflation and unemployment rates likewise had no statistically significant correlation to these election outcomes. The study carried its analysis all the way back to 1824, the first year for which there are reliable popular vote data. Its analysis of unemployment begins in 1940, the first year for which those data are available. In 2012, the Institute’s study became the third-most-downloaded paper of the year on the Social Science Research Network. Today it remains in SSRN’s top 2/100ths (0.02%) of all time. The paper is downloadable from SSRN’s website at http://papers.ssrn.com/sol3/Papers.cfm?abstract_id=1987160. Surprisingly, then, it is never “the economy, stupid,” as Bill Clinton’s campaign strategist James Carville famously intoned. And the stock market is useful for predicting elections only when an incumbent is running. Since no incumbent is running in 2016, neither the economy nor the stock market can help you forecast who’s going to win the White House. “Sometimes knowing what won’t work is just as valuable as knowing what will,” said Lampert. The Socionomics Institute studies social mood and its impact on social events.